STP is committed to providing state-of-the-art audit and compliance tools for our users. Our publications cover National and International Standards and Regulations. STP's guides to ISO 14001 and OHSAS 18001 have been designed to assist in the certification process step by step. Each clause in the standard is described and illustrated with case studies and sample content. ISO 14001 Environmental Management Systems: A Complete Implementation Guide is designed to help users successfully implement effective and efficient Environmental Management Systems (EMS) based on ISO 14001. The implementation of ISO 14001 not only enables facilities and companies to improve their overall environmental performance but also smooths the path towards compliance with national and state regulations. In this guide, each ISO 14001 clause is accompanied by case studies and sample content to assist in the implementation process. The Gap Analysis is divided in rulebooks and sections that cover all of the ISO 14001 clauses. After answering the questions, you will be able to see the gap between your company's current situation and the ISO 14001 requirements. 18001 Health and Safety Management Systems: A Complete Guide to OHSAS and VPP Implementation is designed to help you develop an Occupational Health and Safety Management System (OH&S-MS) that conforms to OHSAS 18001 and/or OHSA VPP. With a well-implemented OH&S-MS in place, costs related to injuries, lost production hours or liability should be substantially reduced. This guide not only will guide you through the development of an OH&S-MS and 18001 certification and VPP registration processes, but also give an overview on ANSI/AIHA Z10-2012 and CSA-Z1000-06. 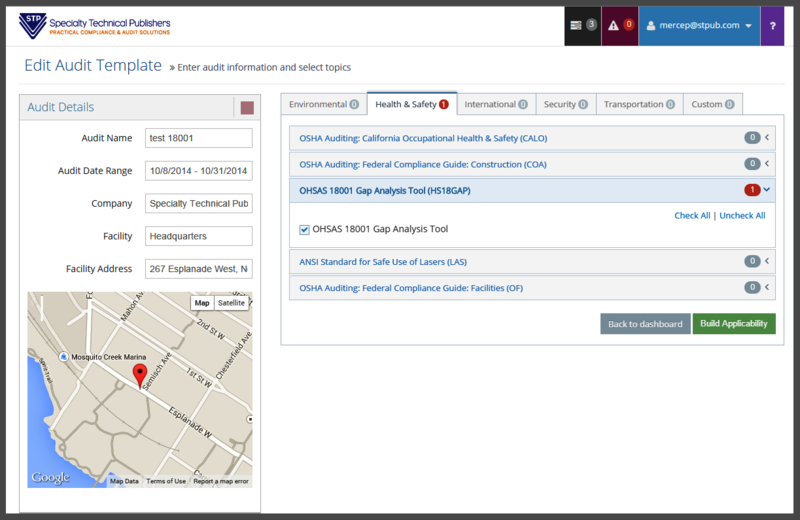 The gap analysis summary helps to compare your facility’s current occupational health and safety performance with the OHSAS 18001 requirements. Read this recent blog post from Jon Elliot: "Complying with ISO 14001 and OHSAS 18001"
our powerful Excel®-based Excelerator tool. STP's authors are practicing experts who regularly update audit guidance to reflect changes in regulations and industry standards. STP Audit Suite is designed for those organizations that need an affordable yet comprehensive EHS audit management system. STP Audit Suite allows you to add custom questions and scoring, accomodating your organization's established procedures. Our clear and intuitive user interface lets you focus on the audit. No special technical skills necessary. Free training available. 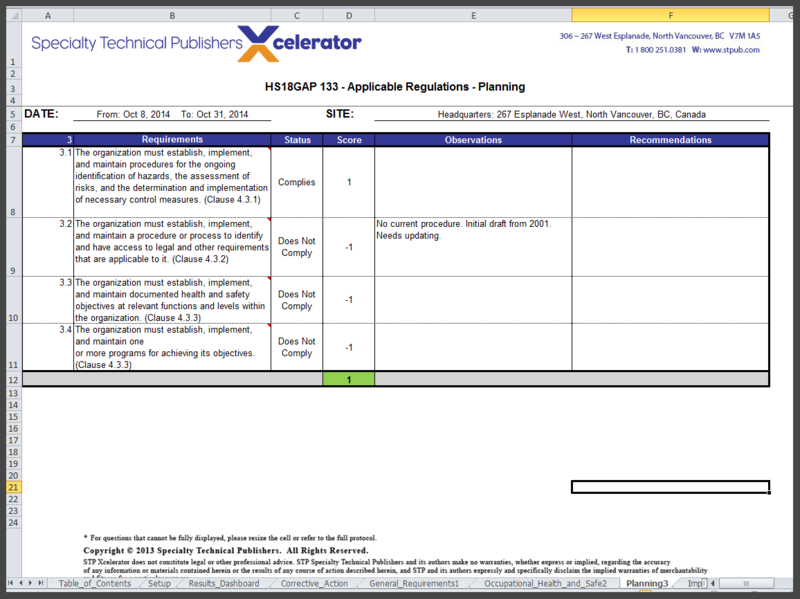 Xcelerator for performing your audit and tracking results. Select audit topic modules from across all publications you are subscribed to, including State Differences for USA. Then identify the applicable rulebooks and rulebooks sections by answering a series of applicability questions. Create custom topic modules and audit questions and/or define a custom scoring system to adapt the STP audit content to the reality of your organization or facility. See all the your audits (past, in progress, scheduled) in a calendar format. View a list of all regulatory citations covered by your audit, cross-referenced to the topic module, rulebook section, and specific audit question. Guide notes details are accessible in a click. 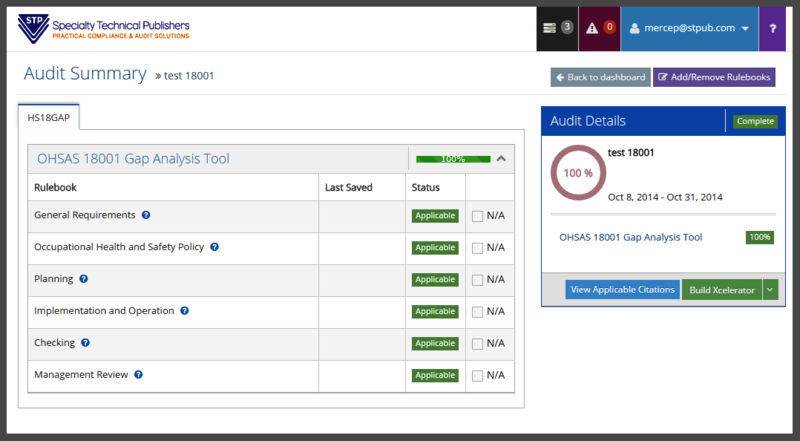 The Applicability Tool renders a comprehensive, customized auditing template that can be shared across your multiple facilities or locations. Easily capture audit observations and recommendations in one document. 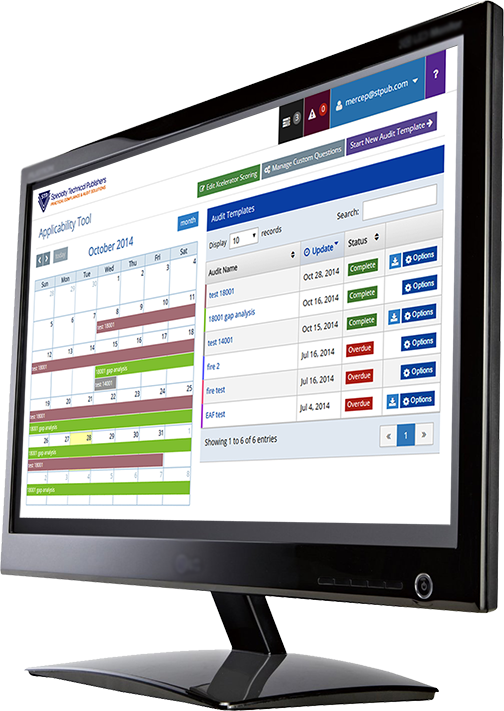 Conduct your compliance audit directly on your laptop or tablet while visiting the premises. Access the Scoresheet Dashboard, assigning compliance scores for each audit question. 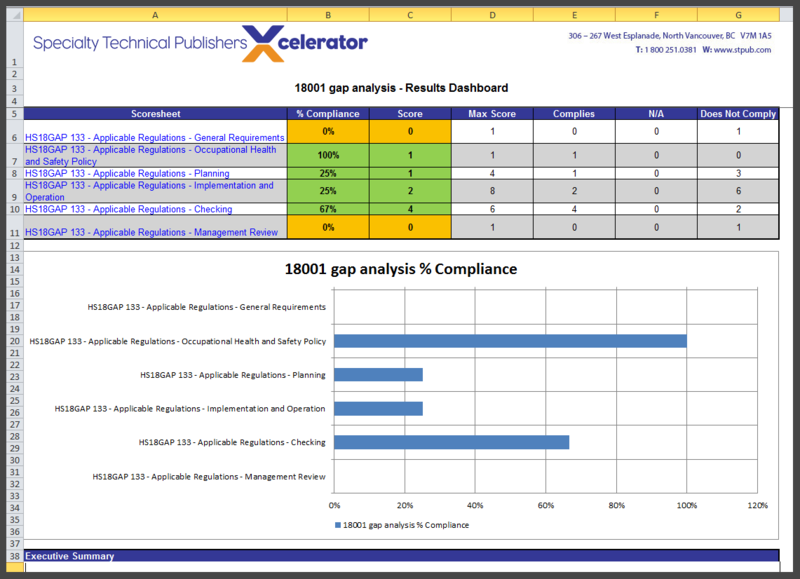 Generate an "at-a-glance" Compliance Result Report, analyze the compliance level of your facility by main area. Easily identify with a customizable color schema the areas that don't comply. Write recommendations in the Corrective Actions Reports page and easily use the template to assign outstanding issues to your staff and easily track the progress of non-compliances. "Flexible, cost-effective and great customer follow-up all describe STP and their products. The products are easy-to-use and provide reference to rules and regulations…I have done extensive research on competitive products and find that STP is the most cost-effective in the marketplace… I highly recommend STP to companies looking for audit and compliance resources guides." “Working with STP saves us time and effort. The STP audit protocols are customizable, and the ease with which we can search the subject areas means that we don’t have to navigate through the usual regulatory websites in order to cite any necessary requirements...Compared to other audit guides, all of the STP guides are updated frequently, and we’ve found there’s no better product in the market." Copyright ©2016 Specialty Technical Publishers. All Rights Reserved.